Walt Disney World Spring Break 2017? This ONE SIMPLE TIP Can Save You HOURS in Line! OK, sorry for the sort of click-baity title this time, but if you’re visiting Walt Disney World for spring break this year, there is ONE THING I absolutely recommend doing to prepare for your visit. As the author of RideMax (a planning tool designed to help people spend less time in line at Disneyland and Walt Disney World), I know you’re probably thinking, “Duhh… He’s going to tell me to buy RideMax.” And while I do recommend RideMax, you’d be wrong if you think that is my FIRST recommendation, as there is something else you absolutely have to do before leaving home if you don’t want to waste hours of your precious vacation time for nothing. What is this simple but critical time-saving tip? BUY YOUR PARK TICKETS IN ADVANCE OF YOUR VISIT! The FastPass+ system allows you to make online reservations for attractions up to 60 days in advance of your visit, and if you have a FastPass+ reservation, it allows you to skip the normal (or “standby”) line and board the attraction relatively quickly — usually in a matter of just a few minutes. The reason you’ll want to buy your tickets in advance is because you can’t make any FastPass+ reservations without an actual ticket number to back the reservation. In short, no park tickets, no FastPass+ reservations. Of course, if you DO wait until your actual trip to buy your tickets, Disney will accommodate you — it just may not be the way in which you’d want. Disney has set up FastPass+ “kiosks” in the parks where you can make your reservations on the spot. The two major problems with using these kiosks to make your reservations is first, you may only find lower-priority attractions to choose from and second, you might have to wait in a very long line just to get to a kiosk. Above is an example, using a picture I took last year during spring break 2016. See the line that starts along the railing to the left of the frame, and extends off into the distance? 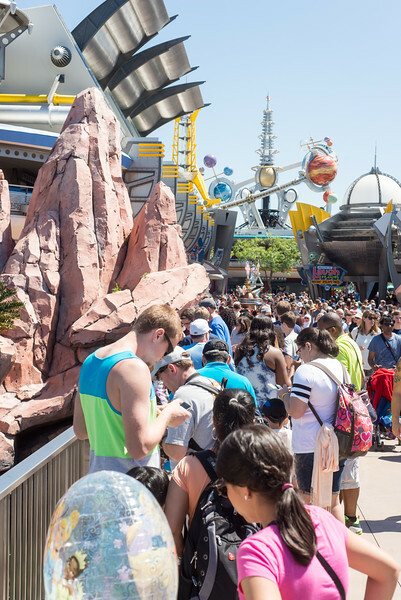 This is the FastPass+ kiosk line in Tomorrowland, and the poor folks standing here are those who likely waited until they arrived at the park to buy their tickets. The FastPass+ kiosks in this picture are located up past the large rock work on the left of the image, and since it can take a few minutes to process each group needing reservations, these guests are looking at a crazy wait. 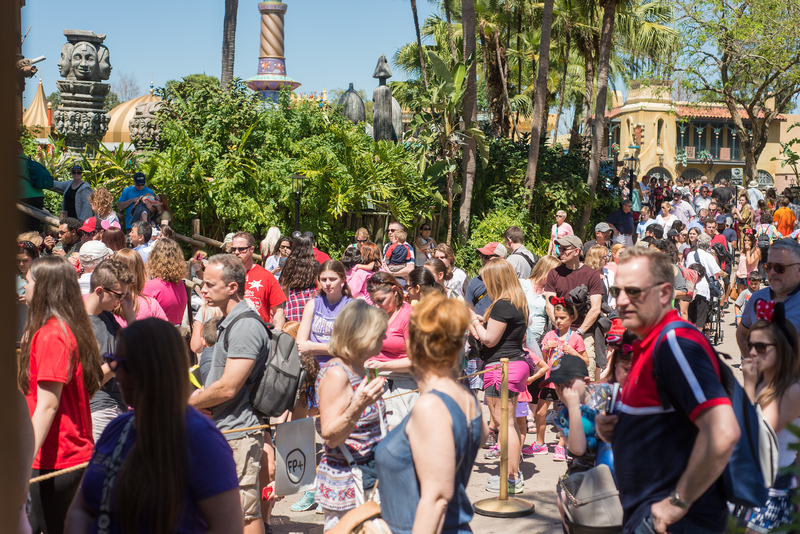 Similarly, above is the scene during last year’s spring break at the FastPass+ kiosks in Adventureland, where we see similar problems. See the girl in the red shirt on the far left side of the image? She is standing near the front of the FastPass+ kiosk line, which is separated from the rest of the crowd by the rope you see down near her waist. To give you an idea of the line for the kiosks, let your eye follow that rope backward toward the center of the image, and then scan the crowd moving toward the far upper-right corner of the picture. If you look really really hard (you may need to click on the picture for a larger view), you’ll see a Disney Cast Member holding a FP+ sign off in the distance to the upper right. That is the start of the line for these kiosks! So, here you have folks who waited until the last minute to buy their park tickets, standing in this huge line, and when they finally do get to the front, you can bet they won’t be getting FastPass+ reservations for Seven Dwarfs Mine Train or other popular attractions with low capacity. They’ll be stuck with reservations for attractions such as PhilharMagic (where you don’t even need a reservation in the first place), or maybe another high-capacity attraction such as Pirates of the Caribbean, which is popular, but only if they’ve arrived at the kiosk early enough in the day. I still remember a couple of years ago, when one of Liesle’s aunts had come to town with their entire family — her husband and children, the children’s spouses, and her grandchildren — and they showed up at the Animal Kingdom knowing nothing about FastPass+. They didn’t know this advice, and bought their park tickets the day they arrived. Of course, they were looking to us to help them with a RideMax plan, but RideMax also depends on efficient use of FastPass+, and they were sort of out of luck in that department. Imagine this — it was her aunt’s very first visit ever to Walt Disney World, and the family had spent thousands of dollars for this once-in-a-lifetime visit, and yet by NOT buying their park tickets in advance, they ended up having a rough time when it came to those important FastPass+ reservations. A needless and perhaps painful blemish on what otherwise may have been a near-perfect trip. QUICK UPDATE 3/4/2017: Based on at least one comment on our Facebook page discussing this post, I did want to mention that if it’s too close to your vacation now to order tickets, you should at least go to Disney’s website and set up an account with My Disney Experience, as well as download the My Disney Experience app to your phone. That way, as soon as you purchase your tickets at the park, you can login to your Disney account on your phone and register the tickets with the Disney app. This will allow you to make FP+ reservations from the app on your phone. You still may not have a great FP+ selection that late in the game, but at least you’ll avoid those kiosk lines. 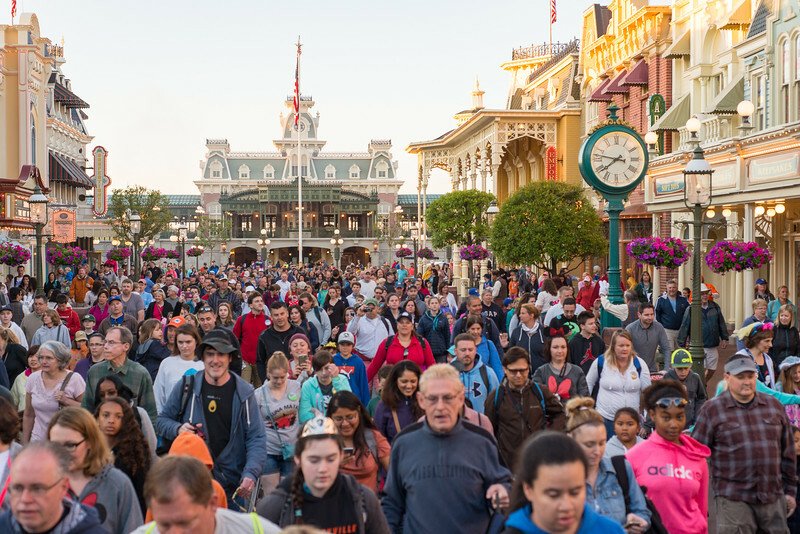 Hopefully I’ve convinced you by now: If you’re visiting Walt Disney World during spring break, be sure to buy your park tickets in advance of your trip, and make those FastPass+ reservations ASAP.